to your FREE articles . . . Your free report will automatically be sent to you by email. I want to say thank you for your help and guidance in welcoming visitors to church as I am a greeter at the church I attend and I am always open to suggestions on how I can improve making persons feel welcome to my church. I look forward to receiving your news letters as I know they would be of great help. I will encourage other members of my group to join your training. You’ll get instant access to the report I promised. 1) Double check your email address. We sent the message to the address you entered. If there is an error in this email address then you will not receive the message. To fix this simply click the back button and enter the correct address. 2) Check your spam inbox. Sometimes spam filters can filter out the wrong emails, so if you are sure that you used the correct email address and you do not see the message then you should check your spam box. With your confirmation, you’ll receive a series of emails from me introducing you to the website and its resources. After that, the emails will settle into a monthly routine near the end of every month. 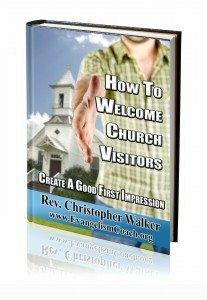 You can find a lot more information on welcoming visitors in my ebook: How to Welcome Church Visitors. It’s available for instant download after purchase and contains lots of useful information on improving your first impressions for church visitors. Including tips you can use for this weekend.